"We own your public transportation, concerts, sporting events, hotel and soon... grocery stores." This thread is reserved to discuss solutions / proposed solutions / ALL SOLUTIONS by the powers that shouldn't be to use false flags to turn our once 'free society' into a 'safety for security' despotic and dystopian future. The very fist place the public must be taken in regards to past false flags, the current Las Vegas and FUTURE false flags on both the American and other people around the globe, is the fact that governments and particularly the US government have not only been caught doing them but have admitted that they have and will conduct them. There are no 'tin foil' pejoratives that can dismiss the hard evidence that governments, particularly the US government has to be a prime suspect whenever a high profile 'event' happens with the great possibility that the government, and the corporations they serve, will most likely benefit from the fallout of the operation. Since we (world wide) live in a 'fascist' form of global government, where governments world wide own over 50% of most corporations through CAFR investments system / schemes, it's only logical that 'certain' corporations benefit greatly from false flag attacks pulled off by governments that have the resources / connections to pull these off. In the recent Las Vegas active 'shooters' operation one company poised / positioned to grow exponentially is an extremely interesting corporation called Leidos. 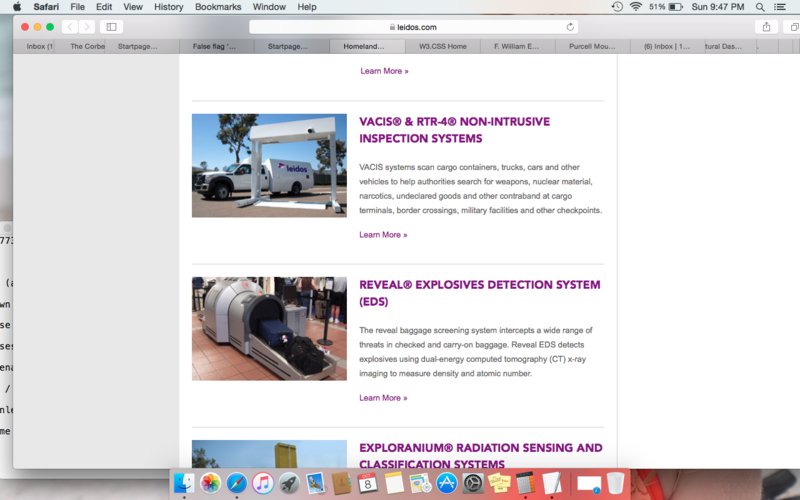 Leidos is NOT your average company by a long shot. If George Orwell wrote about the very company which kept the machines in his epic dystopia novel humming along, it would be Leidos. 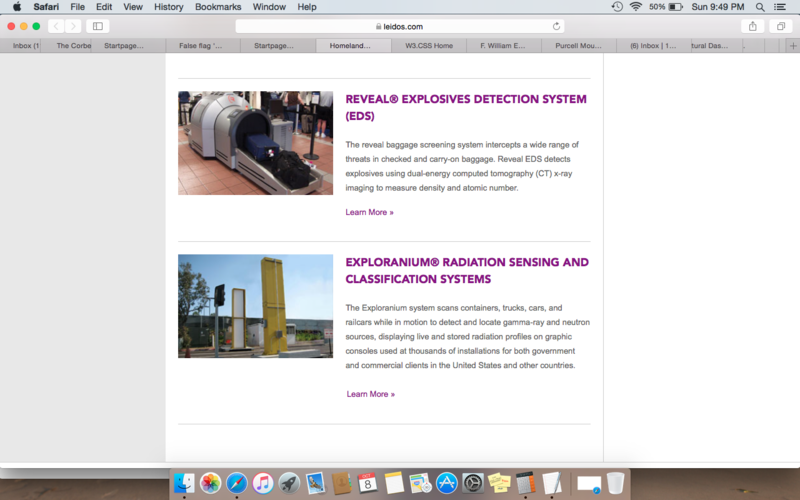 Leidos with it's intimate relations with the intelligence / military / Homeland security industrial complexes complete with CIA / NSA / FBI connections and top secret clearances would be the ideal company to coordinate, with their 'government partners', the very active shooter's' operation that went down in Las Vegas. As dumb luck would have it, Leidos with both the corporate and 'controlled' alt media, arrogantly stupid enough to float out this completely absurd work of fiction, where one of Leidos very own single handedly led the charge and police to the patsy. Led the police to the Patsy's room even though (according to police scanners) the front desk knew which room (one of) the shooter(s) was BEFORE the police showed up, and if the police actually needed help finding a 'known' room, the hotel has their own security trained to work with police. Although, one could argue that they (hotel security) were too busy chasing fake hotel security guards as reported by several eyewitnesses. 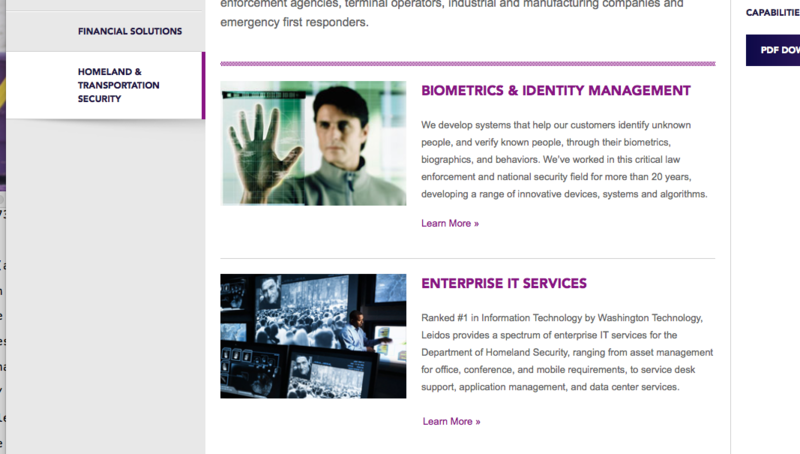 It is kind of comical and worthy of note that once the 'Leidos hero' was id'ed (by yours truly) as an 'intelligence contractor' (for Leidos hem, hem) a 'new hero' was 'quickly' rolled out claiming to have done what the Leidos intelligence contractor did. It sure was great the police got all that help. What would have they done without it? 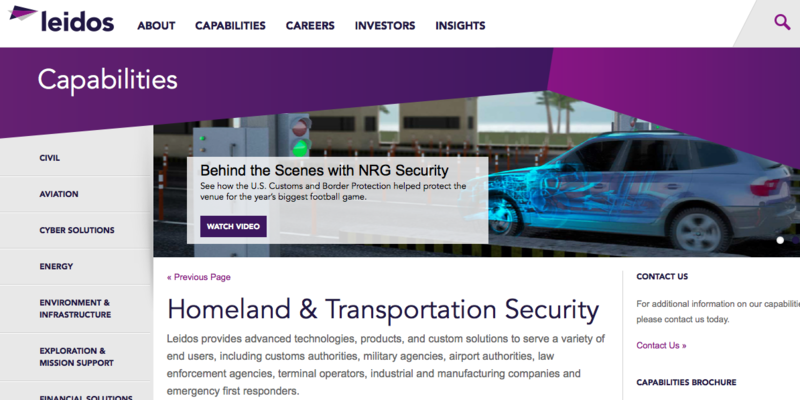 With fiction writing aside, Leidos is the very company who really should be put under a microscope for insider trading as certain 'devisions' of their company single handedly are likely to see the entire company stock value increase as more and more of these and other 'operations' continue unabated. Just one small division of this company is set up to have back scanners in about every public area you could stick one. What really has the hair on the back of my neck sticking straight up is that this company is set to roll out nuclear devise detection scanners. Will we see a nuke false flag in the coming months as well? We (in the US) already have the patsy set up for such an operation. Will Biometrics and net regulations (loss of anonymity) save lives? LEIDOS TO THE RESCUE!!!! Later, major hotel chains like Marriott, Taj and Accor began using explosive trace detectors and X-ray systems throughout the country. In New Delhi, the upscale Lemon Tree Premier hotel set up face-recognition software that allowed employees to identify visitors as they approached the property. But even if Mandalay Bay were on high alert last weekend, snaring Mr. Paddock would most likely have required a level of screening that far exceeds current practices. Timing is everything. Isn't it? Just a little over a week after the latest US false flag Kirstjen Nielsen is appointed to head Fatherland Security. Kirstjen Nielsen is a total globalist whore who specializes in cyber security. Kirstjen Nielsen served on the Resilience Task Force of the Center for Cyber & Homeland Security think tank at George Washington University and served on the Global Risks Report Advisory Board of the (globalist) World Economic Forum. She also was a Fatherland minion (on cyber related issues) under W Bush. I'm looking at this as a 'pre position' move. 2015 'SOLUTION' to stopping 'Soft Target' terror attacks, more uniformed goons stopping and questioning people as a norm in society. My question. How will this stop 'state sponsored' soft target attacks? Soft targets are called soft for a reason — they're easy for a terrorist to strike, and nearly impossible for well meaning businesses and individuals to defend. But terrorism experts say there are things that companies and people can do to derail a terrorist attack such as the one seen in Paris last week — well before the attackers can even fire a shot. Part of the solution is aggressive but polite monitoring of the area surrounding a concert hall, stadium or other venue, said William Braniff, the executive director of the National Consortium for the Study of Terrorism and Responses to Terrorism and a former instructor at West Point's Combating Terrorism Center. He said American companies can look to security experts in Israel for tips on how to handle inbound threats. "Instead of just having passive security guards who stand still," he said, security teams should "engage in conversation, to move around outside of a sports venue, outside of a shopping mall, and engage with people. And by doing this you're not off-putting, you're not menacing. You're, instead, just probing a little bit." The idea, Braniff said, is for security teams to ask questions about why people came to the venue, who they are, all the while looking for people who may be nervous or seem out of place, or not able to provide basic answers ("You seem a little nervous, could you come with us please" No, violation of the 4th and fifth amendment to see here folks just move along.). That way, security can intercept a potential attacker before he is prepared to strike, giving security a better chance at disrupting the attack. Minneapolis police, in conjunction with the NFL and terrorism experts, put together a set of instructions for people in that city explaining how to intercept terrorists before they can attack. The concept is based on intelligence that suggests ISIS and al-Qaida terrorists have gone to great lengths to prepare their attacks in the past — and each step in that preparation represents an opportunity to derail an attack before it happens. Here are the eight steps of preparation they recommend everyone watch out for. Surveillance: Often, terrorists will observe the site of a planned attack well in advance, sometimes even with enhanced vision devices including binoculars. Experts say to watch for people taking pictures in places where tourists normally wouldn't — doors, security checkpoints, staff areas and the like. Information Gathering: The initial observations can include asking detailed questions of people onsite, including details about shift changes or access to a facility. Watch for inappropriate interest by people who do not appear to have any business at a venue. Testing Security: Sometimes terrorists will conduct tests, such as creating a disturbance or pulling a fire alarm to see how long it takes for officials in a given location to react. Treat any such incidents seriously and get to the bottom of who staged them and why. Funding: Terror attacks such as the one in Paris do not cost a large amount of money, but financing has to be arranged and money sent to attackers to pay for their activities. That's an opportunity for financial experts and people witnessing the transactions to ask questions. Acquiring Supplies: Often, terrorists will have to rent cars, purchase vehicles or acquire equipment to be used in the attack. Again, keep an eye out for large cash transactions or untraceable cash card purchases — and people who don't have a ready or believable reason for making the purchase. Impersonation: Stealing uniforms of construction workers, hospital officials or even police can often be a precursor to an attack as well — as a way of putting together disguises that will enable the attackers to slip in and out of a venue undetected. Watch for and report thefts of any such gear. Rehearsal: Often part of a team or an entire team will conduct a dry run at a target. This can be another opportunity to intervene. Deployment: Finally, in the last minutes before a strike, terrorists have to gather their weapons, and transport themselves to the scene. Anyone seeing people with weapons or explosives in a car, on the sidewalk or entering a venue should immediately call 911 — the faster police can arrive to the scene, the less time the attackers will have before someone stops them. You’ve decided to boycott Google? Congratulations! That’s a great idea! But now, where do you go for alternatives? Are there any other search engines? Join The Corbett Report’s open source investigation into search alternatives as we explore the good, the bad, and the ugly of online filter bubbles. If the Vegas shootings trigger other such attacks will Donald Trump use his resorts, office buildings and other properties to usher in the biometric papers please TSA in your face to set a trend for all work and social spaces to follow suit? haven't mastered doing that pink quotation box thing yet. although I assume you are being a wee bit sarcastic/ironic here to emphasize your point. We little kids having to worry when the bomb was going to drop. "When the sirens blow, RUN as fast as you can, go there and wait for me to get you". so he could be "experienced" in managing people during a nuclear attack. which was within a mile from our house. so admin was telling management to expect to be targeted by the USSR. NYC was located just a few miles away. a game all primary school kids should learn how to play. Because it really is a head game. ‘Armed special forces troops are being deployed on the London Underground and have been told to ‘shoot to kill’ terrorists. Members of the SAS and the Special Reconnaissance Regiment have been told to target terrorists who are on trains, buses and planes. It is believed some of the troops will patrol the busy tube network in the capital in pairs and will be disguised as couples. They will be armed with Glock 9mm semi-automatic pistols so they can ‘take down’ potential gunmen and suicide bombers, reports the Daily Star Sunday. Those in the special covert teams have been trained at the SAS base in Hereford for the past few months. A GOVERNMENT HELLBENT ON DISARMING THE POPULATION BENEFITS FROM 'LONE WOLF' ACTIVE SHOOTER OPERATIONS. Each of these bills is an egregious assault against the Second Amendment, but the proposed bills that would “ban parts that increase the rate of fire for a semi-automatic firearm” are especially draconian. Ostensibly, these bills are aimed at banning “bump stocks.” Police in Las Vegas are telling us that “lone wolf” shooter Stephen Paddock had “bump stocks” on a couple of rifles that he used to kill 59 people from the 32nd floor of the Mandalay Bay Hotel—a feat that was virtually impossible. If out-of-shape (in other words, FAT), untrained, inexperienced 64-year-old-Paddock could use “bump stocks” as efficiently and expertly as authorities are telling us he did—and at a distance of some 400 yards at night—the Navy SEALS and Army Rangers are wasting a lot of precious time and money enlisting and training 20-year-old musclemen and equipping them with expensive machine guns. Instead, they should be actively recruiting a bunch of old fat guys—and giving them “bump stocks.” What a joke! The wording of these gun control bills is so vague that the ATF or a gun-grabbing judge could interpret the bills to mean just about anything. This is just a clever way of giving the government another opportunity to ban whatever it wants—including banning the semi-automatic rifle itself. This is the REAL OBJECTIVE of gun control zealots. What many people do not realize is that folks who know what they are doing can use a rubber band or belt loop to make a semi-automatic rifle mimic a full-automatic rifle in much the same way as a “bump stock” does. I’m not kidding. Look it up for yourself. Would the bill then ban rubber bands and belt loops? Charles Baldwin makes some excellent points about the NRA. NRA claiming that BATFE should "regulate" aka ban "bump stock" is full sellout statement. They have a long history of selling out gun owners. They approved of putting machine guns on the NFA (National Firearms Act of 1934) ATF correctly ruled that they have no power to regulate bump stock or Franklin Armory BFIII triggers according the legal definition of machine guns in the NFA. Why hasn't NRA urged Trump to appointment 2nd amendment advocate as the head of BATFE. There are plenty of things that Trump can do without passing laws to curb some of the onerous gun relations. Here are some suggestions from the 2nd command at BATFE that "leaked"
Here is another video talking about the NRA sellout. Don't be fooled by people claiming that NRA like Trump is playing 3D chess. Did some one say '3dChess' ? Yes, unfortunately. People have said we need to support NRA even more to stop the proposed gun bills and that we can change the organization from the inside. All this sounds familiar doesn't it. Brady gun grab law firm actually has an agenda 2030 rep on it;s board. "We're going to 'fix people' by plugging their brain into the globalist internet of things"
These mass shootings are also serving to ramp up the 'electronic' medical industrial complex. In this case the march toward 'mandatory' mental screening. Of course the goal is to one day have a cashless society that will require everyone to get a mandatory mental screening in order to buy sell exist. For everyone's 'safety' of course. If the state determines that your 'skepticism' of authority requires that your brain needs to be monitored, so the state can 'heal' you, then you may not only be drugged but plugged into the mental matrix the globalists have waiting for you. Right now, DAVOS, the "we know what's best for you, much better than you know whats best for you" jackasses; are discussing how it is totally rational to believe that your own brain doesn't really belong to you. That authorities, of course, have the right to own (control) your very thoughts, most likely when you have been singled out as a.... TROUBLE MAKER. When ever I've tried to embed a YouTube video with a Time, its always gone fubar. Because I can not do it myself, I don't rate my chances of teaching Palmerston. The Health 'Intelligence' Complex. Using 'health' To Justify Tyranny. The Health 'Intelligence' Complex. Using 'health' & Crisis To Justify Tyranny. The usual globalist suspects... The CDC, Center for Strategic and International Studies (CSIS), the UN, WTO, G7, EU... Have been collaborating since USA's 911 to form a so-called 'global health task force' (with the full backing of the military) to rescue humanity from one health crisis after another, be it staged or not. Each FAKE 'health crisis' which began with the 'Anthrax' US military operation (2002 around 911), have been used to justify more authority for what is being being called by the globalists themselves, the "health intelligence complex' to insure "national security". Which, of course, makes the health intelligence complex an arm of the 'military / national security complex the globalists have built up all around us to rule our lives, in times of great crisis of course. However, after the fallout of these 'health crisis' come rules to live by, that are slowly marching us to a medical dictatorship, where track (biosecurity), trace ("biosurveillance"), with control ("medical countermeasures") being the end game . I brought up the march toward mandating 'brainchips' (posted above) to insure health and of course safety of our 'national health security'. To insure everyone is properly medicated, big pharma and the medical intelligence complex (in this case the tentacle called the FDA) has just approved tracker medication. 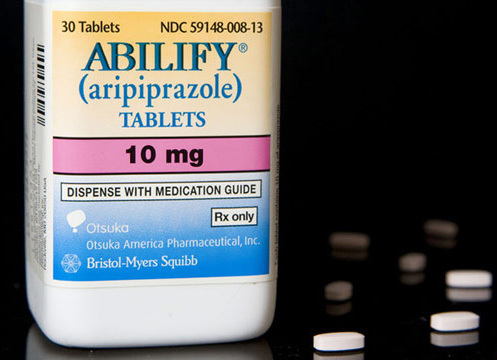 It should come as no surprise that the first pills to be rolled out as a part of the track and trace medical tyranny are the psych meds specifically he psych med Abilify. As I had mentioned in early posts, that false flag and real shooting operations serve the agenda by the globalists to test, monitor humans by a media intelligence complex quite nicely. Of course everyone being vaccine / meds compliant the use of the police state is already as this woman in California found out the hard way MEDICAL PAPERS PLEASE!